We’re proud to welcome Board-Certified Medical Oncologist Basem Goueli, MD, PhD to Thompson Oncology Group. Dr. Goueli will serve as the director of hematology and medical oncology for Thompson Cancer Network and will care for patients at our Thompson Cancer Survival Center – Downtown and Thompson Cancer Survival Center – West locations. Covenant Health is delighted to introduce Basem Goueli, MD, PhD as our new director of hematology and medical oncology of the Thompson Cancer Network. Dr. Goueli obtained his double major in biochemistry and genetics/cell biology at the University of Minnesota-Twin Cities and his MD and PhD degrees from the Mayo Clinic in Rochester, MN. He completed his internal medicine residency at The George Washington University in Washington, DC, during which he received four months of training at the National Institutes of Health in Bethesda, MD. Subsequently, Dr. Goueli completed his clinical fellowship in hematology and medical oncology and his post-doctoral fellowship in biochemistry at Stanford University in Palo Alto, CA. Dr. Goueli joins Thompson Cancer Network after serving as the director of St. Luke’s Regional Cancer Center in Duluth, MN since October of 2012. Under his leadership, St. Luke’s Regional Cancer Center grew by over 300% and was among the fastest growing cancer centers in the country. During his time in Duluth, Dr. Goueli was named as the best medical oncologist in the city and as one of the “Top 20 Under 40” by the Duluth News Tribune. Dr. Goueli uses an aggressive therapeutic approach for his patients, including the pursuit of clinical trial options, and has been highly active in scientific and clinical research throughout his career. He coauthored a paper published in The New England Journal of Medicine (NEJM) in 2013, and was named as a collaborator on two more NEJM papers in 2018. Additionally, Dr. Goueli was the primary author on six scientific papers, was awarded the Stanford DRCA grant and ACS post-doctoral fellowship, and has been showcased on the PBS based program “Doctors on Call.” You can view a video of one of his speaking engagements titled, “Optimizing Your Chances at Surviving Cancer” on YouTube. Dr. Goueli is highly esteemed by his patients and has numerous five star online reviews. Dr. Goueli believes in giving his patients the best of the mind and the best of the heart. 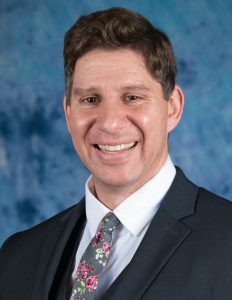 He is adamant about ensuring patients receive cutting-edge care and believes fundamentally in the notion of a “shared humanity.” Dr. Goueli’s hobbies include weightlifting, soccer, tennis, basketball, piano, guitar, singing, writing poetry, and music. Dr. Goueli is currently accepting new patients and is extremely excited about the opportunity to be involved in your care. Thompson Oncology Group is part of Covenant Health, the region’s top performing healthcare network. Community-owned and headquartered in Knoxville, Covenant Health includes nine acute-care hospitals, numerous outpatient and physician clinic locations, and specialty services for behavioral health, oncology, rehabilitation, home care, and community wellness and outreach programs. With more than 10,000 employees and nearly 1,500 affiliated physicians system wide, Covenant Health is recognized regionally and nationally for quality and patient satisfaction, has been named three times by Forbes as one of America’s Best Employers, and is the only health system in East Tennessee on Becker’s list of “150 Top Places to Work in Healthcare” in 2018. Visit www.covenanthealth.com to learn more.